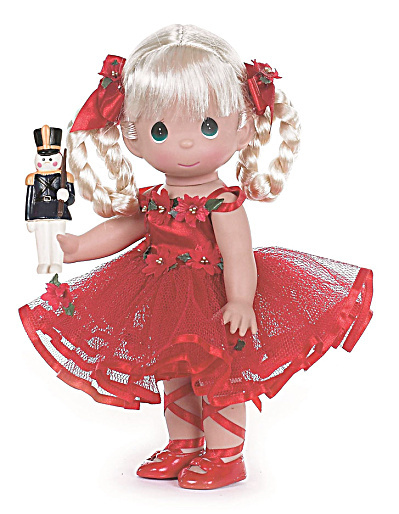 2013-2014 Precious Moments Inc. 12 inch Dance of Joy Ballerina vinyl doll, No. 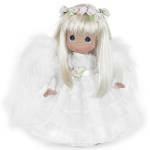 4770 girl has rooted pale blonde hair that is styled in looped braid adored with red bows with poinsettias; painted green teardrop-shaped eyes and a smiling face. 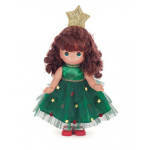 Her ensemble includes a red tutu decorated with red ribbon and poinsettias; and red lacing ballet slippers. She is holding a toy soldier. This ballet doll is a Linda Rick of The Doll Maker design. New, Mint old stock, has a gift box.